The judges said: "This packs a punch. It has a good depth of molasses flavour which is powerful but does not overpower the fruit itself, which comes through well." Dark, moist, silky-smooth and intensely alcoholic, this Jamaican celebration cake is made with organic vine and citrus fruit, finely chopped then soaked in Appleton Jamaica Rum and sherry. Sweetened with organic blackstrap molasses, no added sugar. 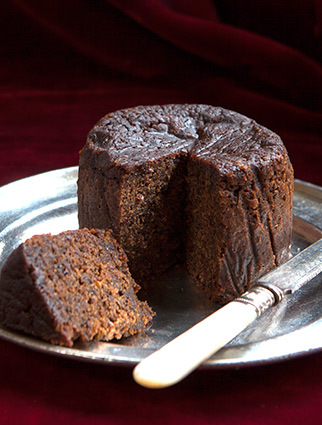 Makes a lovely change from Christmas pudding: serve with a spoonful of rum cream, if you like. All ingredients gluten-free and dairy-free. No nuts used, but not guaranteed free from nut traces. This tousled blonde may look rough-cut, but it's a real gem. The Great Taste award judges said it has "a good texture and evenly distributed fruit. Very generous with the booze ... good flavour throughout." It's made with fudgy organic dried pears, sweet cherries and plump organic sultanas, all steeped in Appleton White Rum – and packed with chunks of organic marzipan. All ingredients gluten-free and dairy-free. Made with the finest organic ingredients, this deliciously dark, moist cake is made with organic vine and citrus fruit and toasted almonds steamed in Appleton Jamaica Rum and Amontillado sherry. Sweetened with organic blackstrap molasses, no added sugar. All ingredients gluten-free. 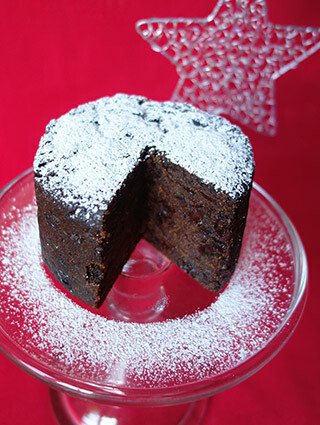 This moist, dark fruitcake is made with the finest organic ingredients: raisins, sultanas & Bramley apples, orange & lemon zests and cold-pressed virgin coconut oil, all steamed in apple juice. Contains ground almonds, and Appleton Jamaica Rum. Lightly sweetened with organic dates, no added sugar. All ingredients gluten-free, dairy-free, egg-free, no animal ingredients. If you order in good time, I can make this cake for you without alcohol. Click here to see my range of gorgeous Preserves - perfect for Christmas! I use Royal Mail Signed For 1st class, Royal Mail Special Delivery by 1pm, or Parcelforce Express, depending on the weight and value of your parcel. 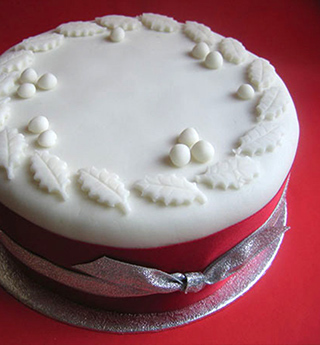 I'll post your cakes in December so they arrive in time for Christmas Day. Please make sure to tell me if you need your cakes early! Please click here for order form and postage. For overseas delivery, I'll calculate your postage and add it to your total. Last First Class posting date for UK Christmas delivery is Thursday, December 20. If you live in London, I can arrange delivery (£5.00 - £30.00 depending on location). 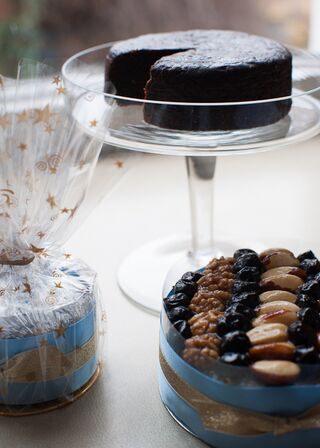 Or you can collect your cake from me in SW9, by arrangement. NB: I have a limited supply of these luscious cakes, so don't delay - order yours now!